Good Show Sir Comments: We must move forward, not backward; upward, not forward; and always twirling, twirling, twirling towards freedom! Just a little off the hem and adapt the neckline to… oops, overdid it. Why are there disembodied hands at lower left? Is she inside one of the boxes from A Tale of Two Clocks, and someone’s spinning her round as a joke? Meanwhile, Janea, a high-dollar call girl, stripper and High Priestess of Freya when she isn’t fighting demons, must contend with a spiritual journey of her own. It’s a journey into Janea’s acceptance of herself in all her dimensions (and what dimensions they are!). Where to locate one’s true inner essence? At a science fiction convention, of course. So, does the cover show her act or her journey? Because it certainly shows her dimensions, and certainly DOES NOT show a convention! The above refers to the main character, not the one pictured on the cover. May I suggest a new tag – dynamic development – . Another fantasy warrior-babe about to cut her leg at the hip. Why does Khachaturian’s Sabre Dance keep playing in my head? I appreciate how the lady on the Grave Matters spine is staring in shock. @fred: without a trace of irony, that review to which you linked could be titled Madonna-Whore Complex: The Series. Are you sure this isn’t a picture from an abstract modern dance performance? A radical rethink of ‘Gone With the Wind’, where a ninja Scarlett shreds some curtains, causes a tornado and makes the fabric stick to her with static. @ Anna T. – The interpretive dance tag. Thanks for reminding me! The Rani Reaps the Whirlwind! There is a very funny vignette playing out here, probably set up deliberately by mischievous GSS Admin—the expression on the face of the woman on the spine of Grave Matters, staring as though in disbelief at that ridiculous red tattery dress, thinking, like, “She’ll do anything to get sheeped!” while the woman on the spine of Fury of the Demon just turns her head away in disgust. At first glance I thought this was a woman underwater being attacked by a tornado of thin fish, or maybe pink eels…not too sure this makes more sense. @Scott B. Ah, but clearly Jim Hines is just jealous of our heroine’s ability to sabre-strip ambidextrously whilst twirling and levitating. Who wouldn’t be? 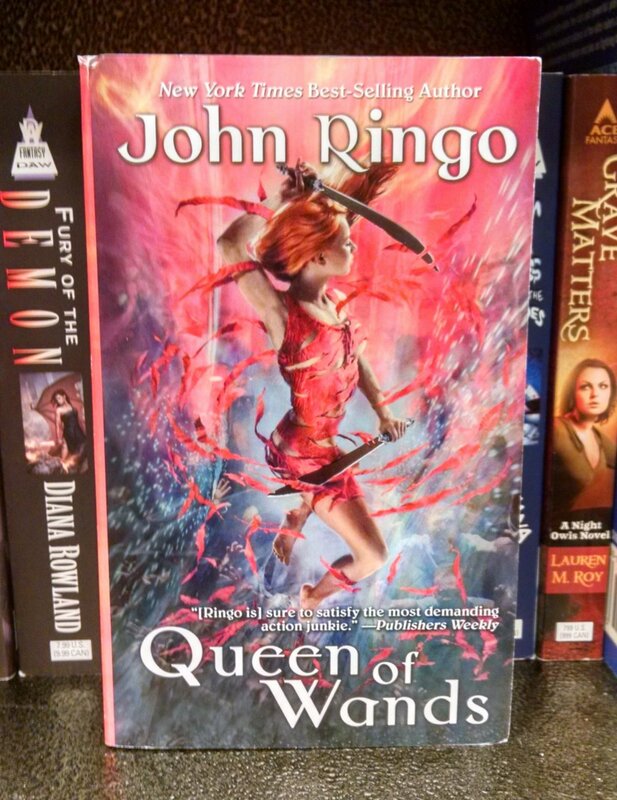 Wait, why isn’t she the Queen of Swords?